We have our first confirmed sighting of a felt Christmas tree in the wild. This one happens to have sprouted up at my niece and nephews house. I received an email complete with a picture. 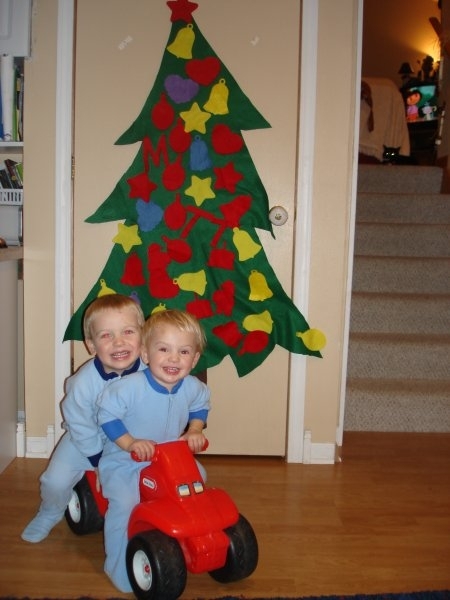 While we shan’t forego our regular Christmas Tree…ever…we did enjoy doing the felt tree. We put it on a door in our lower level and used packing tape. I used the overhead at school to trace the shapes and ours is actually 3 tiers instead of just one. You can see it when you come up for Christmas. We also used the die-cut machine to pump out ornaments. Scissors aren’t our best skill yet and felt is hard to cut. We got the same big felt at Wal-mart. I have a promise of another tree that should be popping up soon. I’ll let you know when the pictures show up.